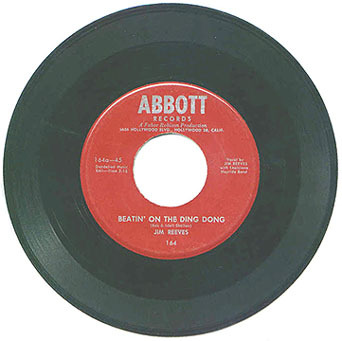 As longtime lead gutiarist and right-hand man Leo Jackson confirms, a good way to get yourself fired from Jim's staff was to mention this song -- "Beatin' On the Ding Dong." Although a lot of us think it's just another cute novelty number from the early Reeves repertoire, Jim apparently did not share our appreciation of it! This Abbott release -- done at the insistence of label owner Fabor Robison -- is likewise very rare.